Married Name 29 November 1892 As of 29 November 1892,her married name was Kruse. Anna Hasz was born in 1870 at Wisconsin. She was the daughter of Christian Jacob Hasz and Katharina Dorothea Elizabeth Westedt. Anna Hasz married Frederich Christian Kruse, son of Herman W. Kruse and Anna Christina Luehrsen, on 29 November 1892. [S246] U.S. Federal Census 1880 U.S. Federal Census, by Ancestry.com, Pg 8. ED265. Dwelling 65. [S244] U.S. Federal Census 1910 U.S. Federal Census, by Ancestry.com, Year: 1910; Census Place: Westfield, Sauk, Wisconsin; Roll: T624_1737; Page: 10B; Enumeration District: 130; Image: 143. Name Variation George W. Hasz was also known as G. W.
George W. Hasz was born on 25 July 1872 at Wisconsin. He was the son of Christian Jacob Hasz and Katharina Dorothea Elizabeth Westedt. George W. Hasz married Frieda Riggert, daughter of Hermann August Riggert and Louisa Elsa Darger, on 3 January 1900. George W. Hasz died in 1966. On 2 November 1930 at 21st birthday party of Runhard Hasz. [S245] U.S. Federal Census 1900 U.S. Federal Census, by Ancestry.com, ED149. Dwelling 131. [S244] U.S. Federal Census 1910 U.S. Federal Census, by Ancestry.com, ED130. Dwelling 47. [S243] U.S. Federal Census 1920 U.S. Federal Census, by Ancestry.com, ED171. Dwelling 252. Stamp 141. [S250] U.S. Federal Census 1930 U.S. Federal Census, by Ancestry.com, ED56-39. Dwelling 86. Married Name 16 May 1890 As of 16 May 1890,her married name was Hasz. Magdalena Winter was born on 16 February 1871 at Wisconsin. She was the daughter of August Edward Ludwig Winter and Johanna Christiana Posner. Magdalena Winter married Henry Hasz, son of Johann Nicholaus Hasz and Marie Margaratha Dorathes Luhrsen, on 16 May 1890. Magdalena Winter died on 29 May 1944 at age 73. [S246] U.S. Federal Census 1880 U.S. Federal Census, by Ancestry.com, NA Film Number T9-1446. Page 284C. ED265. Dwelling 169. Lyaidia Hasz was born in October 1891 at Wisconsin. She was the daughter of Henry Hasz and Magdalena Winter. Martha Hasz was born on 2 May 1893 at Wisconsin. Martha Hasz died on 9 November 1900 at age 7. Elena Hasz was born in April 1894 at Wisconsin. Edward Hasz was born in November 1895 at Wisconsin. He was the son of Henry Hasz and Magdalena Winter. Martin Hasz was born in July 1897 at Wisconsin. Ludwig Hasz was born in April 1899 at Wisconsin. Name Variation August Edward Ludwig Winter was also known as A. E.
August Edward Ludwig Winter was born on 27 December 1838 at Prussia. He was the son of Wilhelm Winter and Henrietta Meissner. August Edward Ludwig Winter married Johanna Christiana Posner on 3 July 1862. August Edward Ludwig Winter died on 24 December 1927 at Loganville, Sauk, Wisconsin, at age 88. Abstract: This collection consists of a transcribed photocopy, from German to English, of the reminiscences of August Edward Winter. Winter served as a German Lutheran minister on the Minnesota frontier, and he detailed his experience in the paper. In the document, Winter described of living conditions, wages, Minnesota communities, the Dakota Conflict, a grasshopper invasion, and Minnesota's pioneers. Biographical Note: August Edward Winter was born 27 December 1838 in Mengeringhausen, Waldeck, Germany to Wilhelm and Henrietta (Meissner) Winter. The Winter family emigrated from Germany to the United States in 1834. He entered the "practical" seminary in 1859. At the Fort Wayne, Indiana seminary, he was forced to take his examinations early because of a shortage of pastors. Following his examinations, he became a Traveling Missionary to Minnesota in 1861. He died on 24 December 1927 in Logansville, Wisconsin. [S247] U.S. Federal Census 1870 U.S. Federal Census, by Ancestry.com, Page 20. Dwelling 150. Name Variation Mary Winter was also known as Maria. Mary Winter was born on 6 September 1883 at Wisconsin. Name Variation Anna Winter was also known as Annie. Anna Winter was born on 2 August 1885 at Wisconsin also reported as Aug 1886. Name Variation John Baptist Dischler Sr. was also known as Dickler. Name Variation John Baptist Dischler Sr. was also known as Johann. John Baptist Dischler Sr. was born on 19 March 1849 at Bavaria, Germany, also reported as Mar 1848. He married Maria Ruhland, daughter of (?) Ruhland and Catherine (? ), on 15 May 1872. John Baptist Dischler Sr. died on 27 August 1928 at Sauk, Wisconsin, at age 79. John Baptist Dischler Sr. immigrated in 1872. [S246] U.S. Federal Census 1880 U.S. Federal Census, by Ancestry.com, NA Film Number T9-1446 Page Number 103B. Married Name 8 May 1936 As of 8 May 1936,her married name was Meise. Martha Elizabeth Bindl was born on 8 July 1911 at Wisconsin. She was the daughter of Thomas H. Bindl and Veronica Pauline Dischler. Martha Elizabeth Bindl married Louis Mathew Meise, son of Henry Carl Meise and Margaret C. Needham, on 8 May 1936. 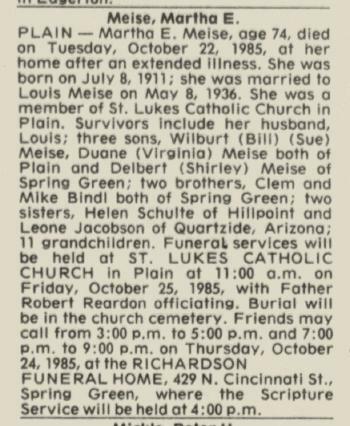 Martha Elizabeth Bindl died on 22 October 1985 at Sauk, Wisconsin, at age 74 Martha (Bindl) Meise obituary. 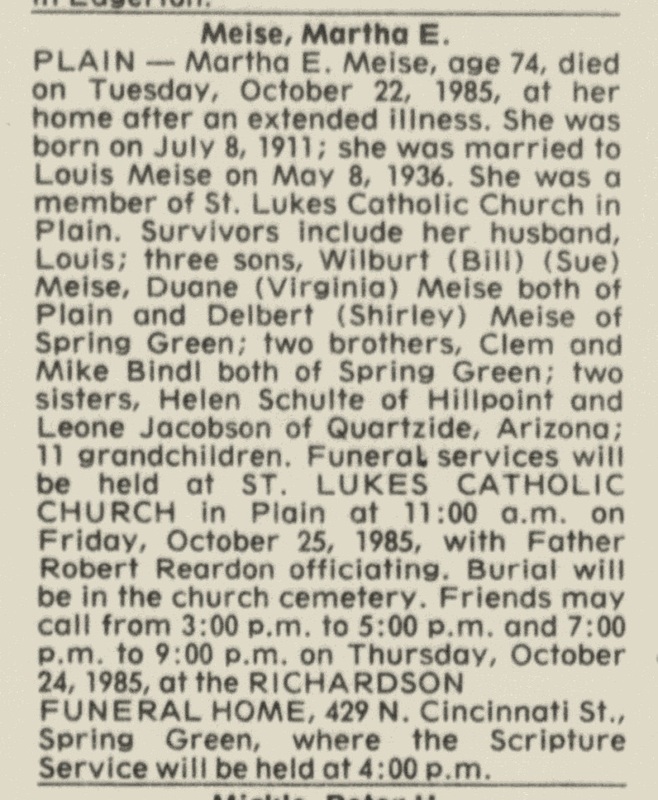 She was buried after 22 October 1985 at New Saint Lukes Catholic Cemetery, Plain, Sauk, Wisconsin. Martha Elizabeth Bindl obtained US Social Security Card at Wisconsin; last residence Plain, Sauk, Wisconsin. Name Variation Michael Philip Bindl was also known as Mike Philip. Name Variation Michael Philip Bindl was also known as Michael J.
Michael Philip Bindl was born on 19 August 1915 at Spring Green, Sauk, Wisconsin. Michael Philip Bindl married Helen C. Meise, daughter of Henry Carl Meise and Margaret C. Needham, on 18 April 1939. Michael Philip Bindl died on 1 December 2006 at age 91 Michael P. Bindl, age 91, of Spring Green, passed away following a brief illness on Friday, Dec. 1, 2006, at the Sauk Prairie Memorial Hospital. 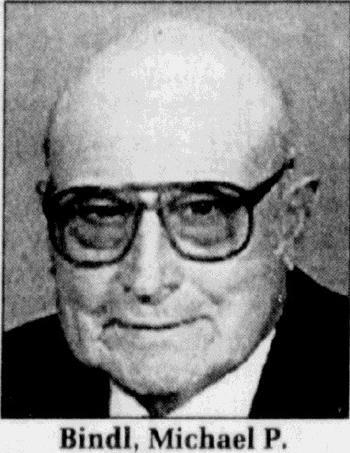 He was born on Aug. 19, 1915, in Plain, the son of Thomas and Veronica (Dischler) Bindl. He was married to the former Helen Meise on April 18, 1939. Mike farmed all of his life, loved to play cards, and work in the woods. He was a member of St. Luke's Catholic Church and the Catholic Order of Foresters. Survivors include his wife, Helen Bindl of Spring Green; five children, Wayne "Buzz" (Geri) Bindl of Spring Green, Connie (Leo) Ellefson of Middleton, Sandra Bindl and Ron Rego of Spring Green, Gary (JoAnn) Bindl of Spring Green, and Linda (John) Niesen of Cross Plains; 13 grandchildren; five great-grandchildren; two sisters, Helen Schulte of Hillpoint, and Leona Jacobson of California; a sister-in-law, Vera Bindl of Spring Green; a brother-in-law, Gerald (Kathleen) Meise of Plain; nieces, nephews, other relatives and friends. 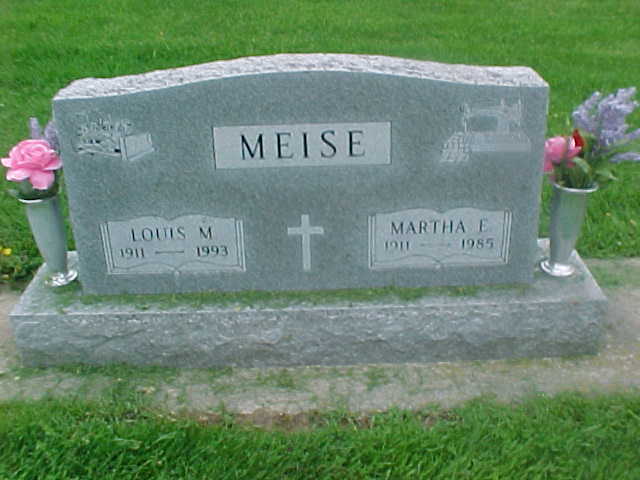 He was preceded in death by his parents, Thomas and Veronica Bindl; two brothers, Clem and Theodore Bindl; a sister, Martha Meise; and two brothers-in-law, Louis and Earl Meise. A Mass of Christian Burial will be held on Tuesday, Dec. 5, 2006, at 12 noon at ST. LUKE'S CATHOLIC CHURCH in Plain. Fr. Mike Resop will officiate with burial in the church cemetery. He was buried after 1 December 2006 at New Saint Lukes Catholic Cemetery, Plain, Sauk, Wisconsin. Michael Philip Bindl obtained US Social Security Card at Wisconsin; last residence Spring Green, Sauk, Wisconsin. He lived in 2006 at 510303 Old Hwy 23, Spring Green, Sauk, Wisconsin. Name Variation Maria Ruhland was also known as Ruland. Name Variation Maria Ruhland was also known as Anna Maria. Name Variation Maria Ruhland was also known as Mary. Married Name 15 May 1872 As of 15 May 1872,her married name was Dickler. Married Name 15 May 1872 As of 15 May 1872,her married name was Dischler. Maria Ruhland was born on 7 August 1852 at Bavaria, Germany. She was the daughter of (?) Ruhland and Catherine (?). Maria Ruhland married John Baptist Dischler Sr. on 15 May 1872. Maria Ruhland died on 21 October 1928 at age 76. Maria Ruhland immigrated in 1872. She had 10 with 9 living in 1900 children. 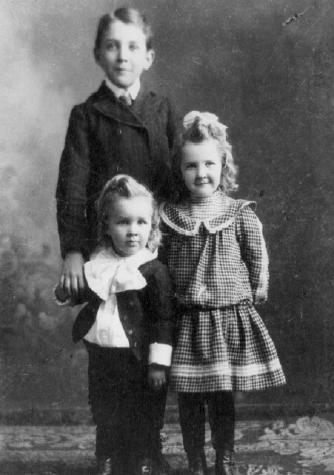 Children of Maria Ruhland and John Baptist Dischler Sr.
Mary Kaercher was born in May 1891 at South Dakota. She was the daughter of Leonard Michael Kaercher and Mary Agnes Croal. Mary Kaercher died in 1902. Name Variation Charles Basil Kaercher was also known as Charlie. Charles Basil Kaercher was born on 28 June 1892 at South Dakota. He was the son of Leonard Michael Kaercher and Mary Agnes Croal. Charles Basil Kaercher married Madeline F. Meyers, daughter of (?) Meyers and (?) Howley, circa 1923. Service Info. : CPL US ARMY. Circa 1902. [S329] Minnesota Death Index, 1908-2002 (published), State File Number: 032578. [S250] U.S. Federal Census 1930 U.S. Federal Census, by Ancestry.com, ED50-36. Dwelling 396. Zita Marcella Kaercher was born on 9 April 1898 at South Dakota. Zita Marcella Kaercher obtained US Social Security Card at Minnesota; last residence Saint Paul, Ramsey, Minnesota. Circa 1902. [S329] Minnesota Death Index, 1908-2002 (published), State File Number: 007416. [S250] U.S. Federal Census 1930 U.S. Federal Census, by Ancestry.com, ED16-2299. Sheet 11B. Name Variation Leonard Marcus Kaercher Jr. was also known as Kaucher. Leonard Marcus Kaercher Jr. married Irene McGuire, daughter of Francis H. McGuire and Eleanor Q. Baxter, circa 1926. Leonard Marcus Kaercher Jr. married Roma Fisher, daughter of Guy Emerson Fisher and Lillian Evelyn Goodberlet, on 10 July 1942 also reported as 10 July 1941. Leonard Marcus Kaercher Jr. married Nancy Slator after 1950 at 3rd marriage for him. Leonard Marcus Kaercher Jr. obtained US Social Security Card at Minnesota; last residence Minneapolis, Hennepin, Minnesota. [S9] South Dakota, South Dakota Birth Records South Dakota, State File Number: 645020 (unknown file date). [S329] Minnesota Death Index, 1908-2002 (published), State File Number: 028269. [S250] U.S. Federal Census 1930 U.S. Federal Census, by Ancestry.com, ED62-150. Dwelling 262. Arthur F. Hasz married Emma E. Roecker, daughter of Edward W. Roecker and Louise Radtke. 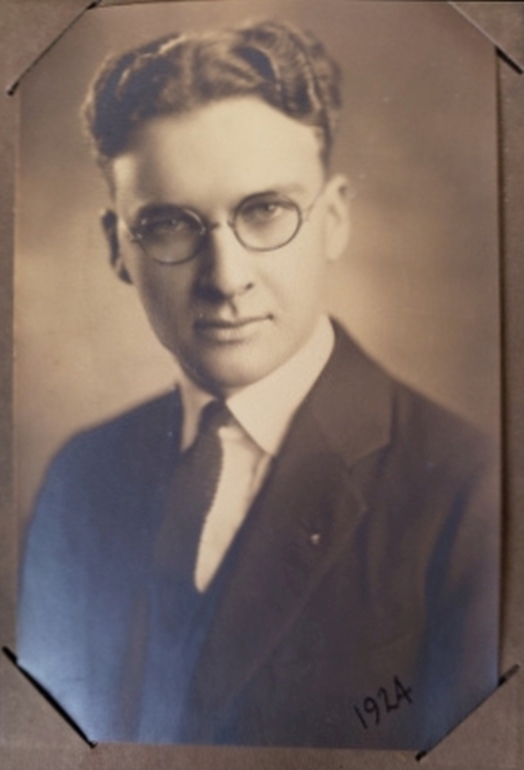 Arthur F. Hasz was born in 1911 at Wisconsin. He was the son of Theodore N. Hasz and Wilhemina B. (?). Arthur F. Hasz died on 9 March 1968. [S243] U.S. Federal Census 1920 U.S. Federal Census, by Ancestry.com, ED171. Sheet 10B. Dwelling 205. [S250] U.S. Federal Census 1930 U.S. Federal Census, by Ancestry.com, ED56-39. Dwelling 137. Name Variation Hertha Meta Emilie Hasz was also known as Bertha. Married Name 20 September 1936 As of 20 September 1936,her married name was Thies. Hertha Meta Emilie Hasz was born on 1 August 1913 at Wisconsin. She was the daughter of Theodore N. Hasz and Wilhemina B. (?). Hertha Meta Emilie Hasz married Erwin A. Thies, son of Henry F. Thies Sr. and Bertha E. Ritzer, on 20 September 1936. Hertha Meta Emilie Hasz died on 1 January 1995 at age 81. 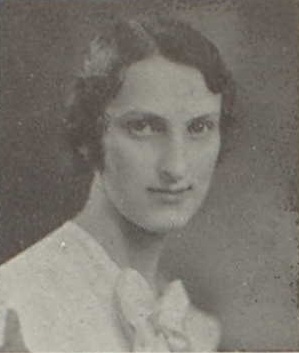 Norma Hasz was born circa November 1915 at Wisconsin. Norma Hasz graduated in 1934 at Reedsburg High School, Reedsburg, Sauk, Wisconsin. Aaron V. VanNatta was born on 2 August 1810 at Harmony, Warren, New Jersey. He was the son of Samuel John VanNatta and Mary Polly Snyder. Aaron V. VanNatta married Elizabeth Kishpaugh on 3 March 1831 at Harmony, Warren, New Jersey. Aaron V. VanNatta died on 17 March 1881 at Harrison, Grant, Wisconsin, at age 70. [S249] U.S. Federal Census 1850 U.S. Federal Census, by Ancestry.com, Stamp 395. Page 789. Dwelling 373. [S248] U.S. Federal Census 1860 U.S. Federal Census, by Ancestry.com, Dwelling 670. Page 88. [S247] U.S. Federal Census 1870 U.S. Federal Census, by Ancestry.com, Pg 16. Dwelling 117. [S246] U.S. Federal Census 1880 U.S. Federal Census, by Ancestry.com, ED 107. Dwelling 156. Married Name 3 March 1831 As of 3 March 1831,her married name was VanNatta. Elizabeth Kishpaugh was born on 8 February 1811 at Harmony, Warren, New Jersey. She married Aaron V. VanNatta, son of Samuel John VanNatta and Mary Polly Snyder, on 3 March 1831 at Harmony, Warren, New Jersey. Elizabeth Kishpaugh died on 28 March 1896 at Harrison, Grant, Wisconsin, at age 85. Samuel John VanNatta was born on 12 June 1777 at Oxford, Warren, New Jersey. He was the son of John VanNatta and Margaret McCracken. Samuel John VanNatta married Mary Polly Snyder circa 1799 at Harmony, Warren, New Jersey. Samuel John VanNatta married Morgan Hanline after 1824. Samuel John VanNatta died on 16 December 1847 at Harmony, Warren, New Jersey, at age 70.
, Page 721 Washington Twp. Married Name circa 1799 As of circa 1799,her married name was VanNatta. Mary Polly Snyder was born on 12 April 1783 at Harmony, Warren, New Jersey. She married Samuel John VanNatta, son of John VanNatta and Margaret McCracken, circa 1799 at Harmony, Warren, New Jersey. Mary Polly Snyder died on 8 March 1872 at Harmony, Warren, New Jersey, at age 88. Name Variation Harvey Love VanNatta was also known as Herley Love. Name Variation Harvey Love VanNatta was also known as H. L.
Harvey Love VanNatta was born on 8 November 1854 at Fredericksburg, Spotslyvania, Virginia. He was the son of Aaron V. VanNatta and Elizabeth Kishpaugh. Harvey Love VanNatta died on 8 December 1932 at Sparta, Monroe, Wisconsin, at age 78. [S343] "Diary of Nellie Emery,." [S244] U.S. Federal Census 1910 U.S. Federal Census, by Ancestry.com, ED42. Dwelling 99. Stamp 234. [S250] U.S. Federal Census 1930 U.S. Federal Census, by Ancestry.com, ED30. Page 13A. Samuel VanNatta was born on 20 May 1820 at Harmony, Warren, New Jersey. John VanNatta was born on 15 December 1743 at Harmony, Warren, New Jersey. He was the son of Arien VanNatta and Elizabeth Chrisom. John VanNatta married Margaret McCracken, daughter of Robert McCracken, in 1766. John VanNatta died on 9 August 1816 at Reading, Fairfield, Ohio, at age 72.